Woodrow West and Ian Gaynair notified CONCACAF about the match fixer who was offering them thousands of dollars to lose the game at a specified score. 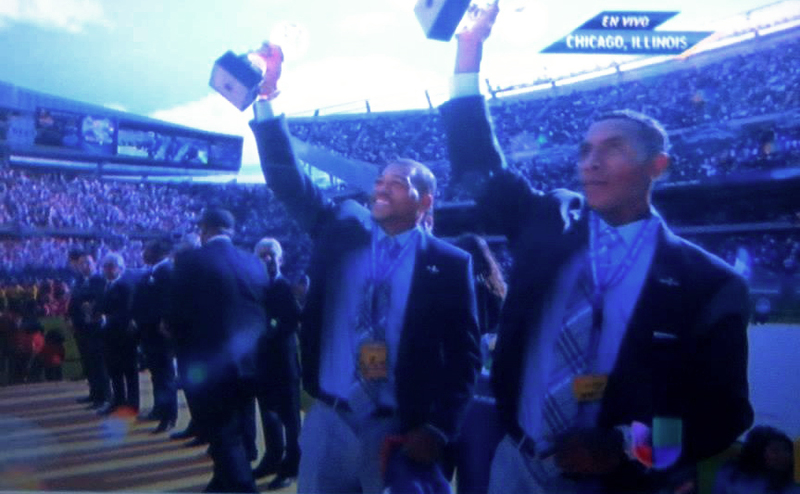 CONCACAF recognized the players’ “bravery and commitment to preserving the integrity of our game.” Following Belize’s participation in the tournament, they were invited to Chicago to watch the finals of the Gold cup. They were also invited to the UNCAF President’s, Rafael Tinoco banquet where the mingled with players and local celebs. At the end of the game in which the United States beat Panama one to zero, West and Gaynair were on the field where they were presented with trophies for their integrity and honor during the Gold Cup. The priceless and proud moment was blasted across living rooms across the country and millions in other countries who watched the final game. The two players will return to Belize in early August. Congrats! We applaud our players for doing the right thing. You deserve all honors that have been bestowed. But let’s get real……….. we want to see them getting trophies for winning games, tournaments. This is why they are called “football” team. Let’s get real indeed! If we want them bringing back trophies from winning games and tournaments, then we have to INVEST in them and SUPPORT them – BEFORE we send them out there, not while they are out there playing the game already.